Unique, Cozy and Fun Fall Craft Ideas for Kids and Adults for Home and Parties, Take Your Pick! 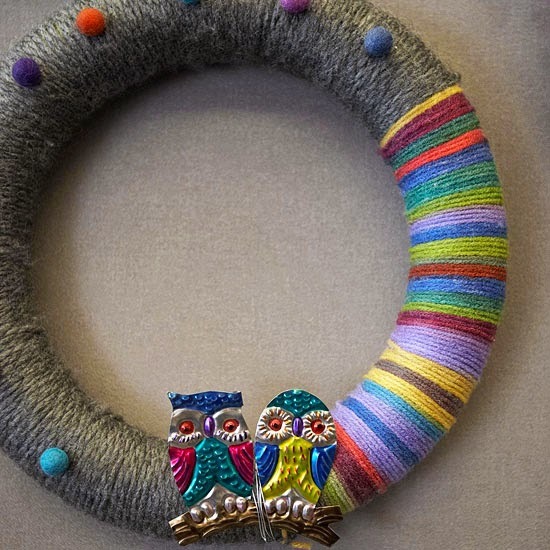 Yarn Wreath with Owls ~ This couldn't-be-easier fall wreath works with any of your favorite motifs: owls, leaves, pumpkins, and more. Simply wrap a foam wreath with yarn, alternating colors as desired and securing with hot glue. Use a bit of yarn to secure a brooch or tin embellishment, such as these owls. Finish by hot-gluing pom-poms around the wreath and adding a hanging loop. Cable-Knit-Covered Bin ~ A recycled felted cable-knit sweater makes this storage container worth cuddling up to. Slip a felted sweater over a hatbox, shipping box or basket, and adhere it to the inside and bottom using hot glue. 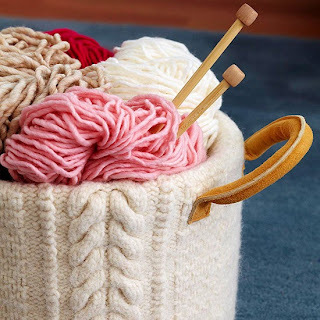 Add handles found at many hobby stores (leather handles shown here) to finish off a cozy container for yarn, books, games, or other necessities. 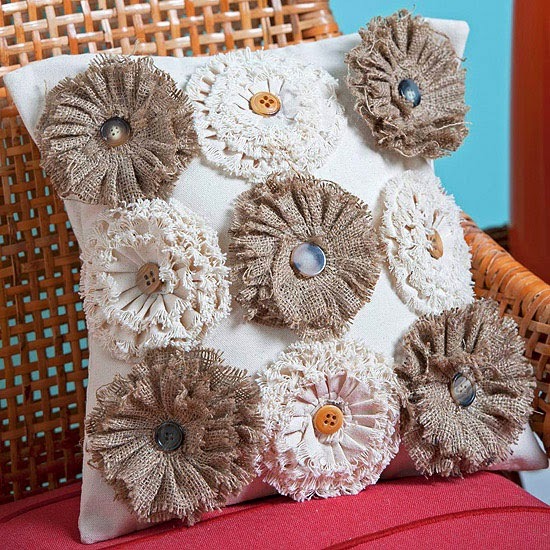 No-Sew Burlap Blooms Pillow ~ Dress a pillow in cozy fall textures without sewing a stitch in this fun fall crafts project. Layer and secure purchased burlap-and-canvas flowers of different sizes using fabric adhesive. Top each flower center with a button, and adhere the flowers to the pillow, arranging as desired. 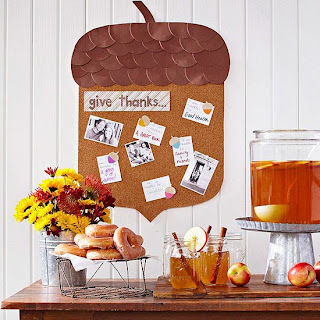 Give Thanks Corkboard ~ Get ready to celebrate fall with an acorn-shape corkboard that inspires you to give thanks. Simply cut an acorn shape from purchased corkboard and use punched cardstock cirlcles to create the cap. Hang it in your kitchen, at a party, or save it for Thanksgiving. 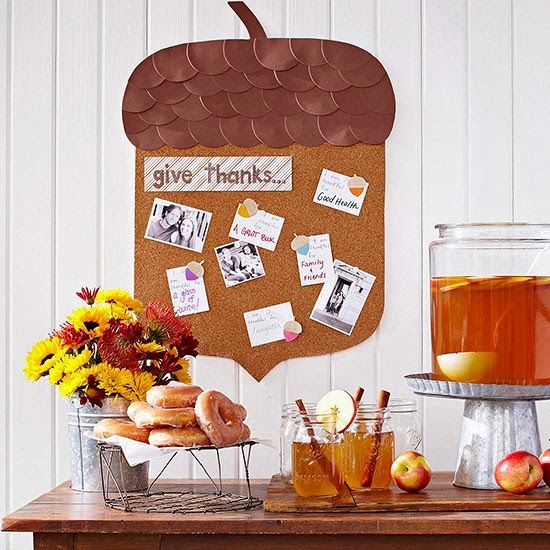 Bonus: Kids will love helping fill the board with their favorite things. 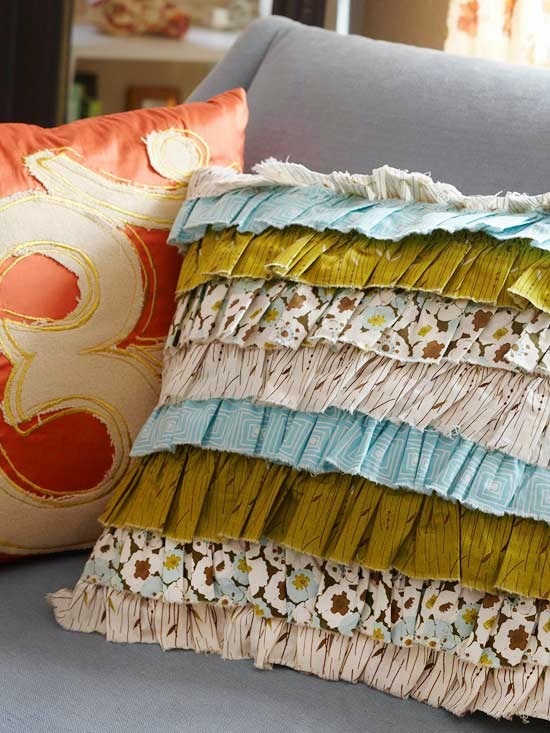 Ruffle Pillow ~ Update an accent pillow in less than an hour by adding pretty ruffles to the cover. 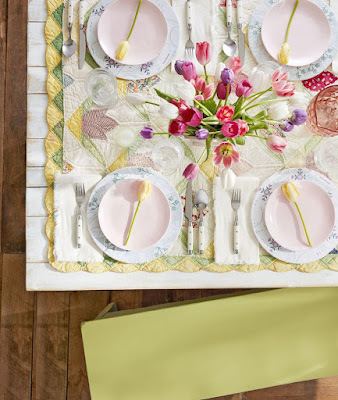 Coordinate the different fabrics with existing furniture or linens to refresh the look of a room for fall. Pattern Here. Acorn Garland ~ This fun acorn garland is a creative way to get the kids excited for fall. 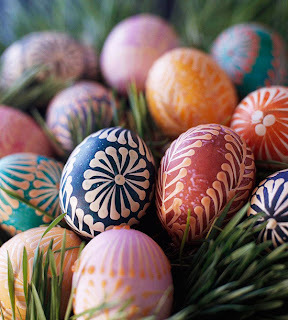 Start by taking purchased paper globes and tracing the shape of half of an acorn onto the unopened decoration; cut out. Trimmed and painted paper bowls are topped with painted wine corks to complete the caps. Hot-glue caps to opened tissue-paper acorns and string together using a long length of burlap twine tied around each acorn stem. 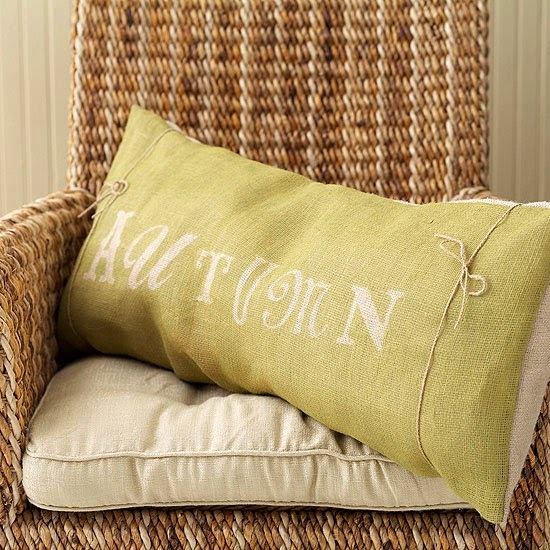 Autumn Pillow ~ Celebrate the weather change with a pillow that announces the season. Lay a pillow cover on a flat surface and arrange large chipboard letters across it. Use repositionable spray adhesive to adhere the letters. 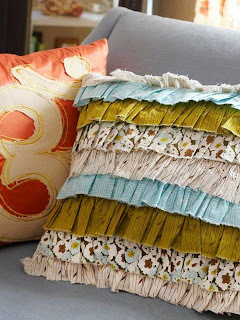 Spray the pillow cover with fabric paint in your desired fall color; let dry. Remove the chipboard letters and insert a pillow form in the cover. Tie jute twine in bows near the ends for even more texture. Glitzy Acorns ~ Use acorns as a sophisticated display in your home. 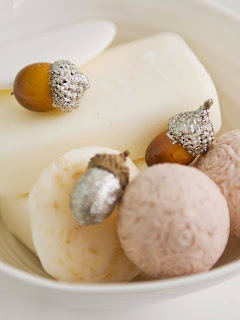 Mix silver glitter with silver paint and coat the acorn caps or the acorn body. 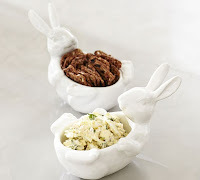 Group them in a bowl for shine or scatter them with other natural elements for a pop of sparkle. Sweater Throw ~ Get cozy on the couch this fall with this fun fabric throw made from upcycled wool sweaters. 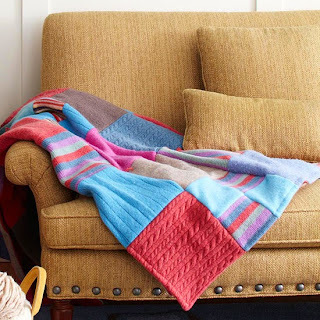 Decide the desired size of your throw and determine how many 9-inch squares of felted wool fabric you will need; we made a few of our large squares by sewing four 5-inch squares with right sides together using a 1/2-inch seam allowance. 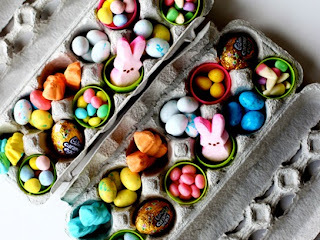 Once you have all of your squares, arrange in an attractive pattern. Sew together rows of blocks using a 1/2-inch seam allowance, then sew the rows together, matching the seams. Back the quilt with a cozy flannel sheet, sew perle cotton ties at the intersections, and then topstitch 1-inch from the edge around the perimeter to finish. 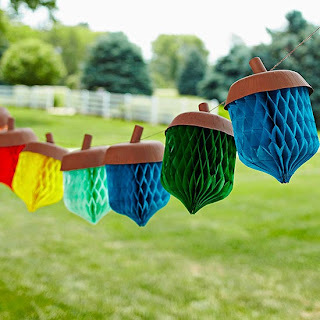 Fall Crafts Tip: To create the nonraveling fabric, turn the pieces inside out and toss into the washing machine on a hot-cycle wash with detergent; machine- or air-dry. Acorn Treats ~ Go nuts! Make adorable acorn treat holders this fall. 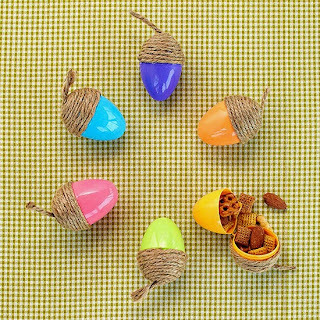 Not only are they great for sending in school lunches, but the easy fall craft is a thoughtful party favor or decoration, too. 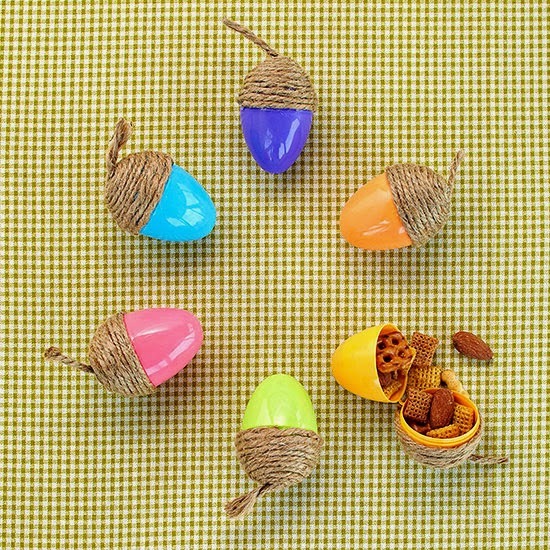 To make, simply hot-glue twine around the wide end of a plastic Easter egg, then fill with snacks, candy, or other fun treats. 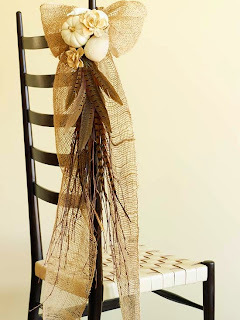 Chair Decoration ~ Give a chair neutral natural elegance. Tie a jute ribbon in a bow around one chair post. Gather twigs and pheasant feathers so the feathers fan out. Secure to the chair with crafts wire. Spray-paint small pumpkins and gourds white. Hot-glue three or four to hide the wire. Finish by inserting white dried flowers.